This proven lesson has been successful in giving students a fun and interactive way of learning about important African Americans - perfect for Black History Month, or any time of the year! We give you recommended procedures that you can modify to suit your needs. Before the lesson begins, it’s helpful to be sure students come to class with QR code readers already installed on their devices. Many newer phones have this feature built right into the camera app, but there are several free apps for both iOS and Android in their respective app stores. This lesson can be used in a 1:1 (one school provided device for each student) school, or in a BYOD (Bring Your Own Device) school. If you do not have a device for each student, simply put students in small groups. hallways at heights your students will be able to reach. For a fun added challenge, place them in “sneaky” locations that are tricky, but not impossible, to find. This can be done within a single classroom, but headphones would likely be necessary. Space them out as far as possible. 2. Students can start this activity in any order ‐ starting with #1 isn’t necessary. 3. Students will find a QR code and read the questions on Student Page 1 that correlate to the same number next to the code. video, some will take them to a short written biography. 5. Students will identify the name of the person featured, as well as the answer to the ques on. works for most middle and high school students. A li le more me may be necessary for elementary students. 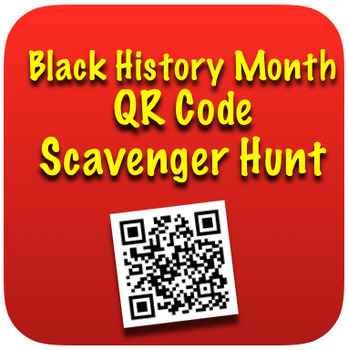 This activity can later be extended by having students do research and report/presentation on on a prominent figure in African American history ‐ from this list or not. I hope this activity is FUN and REWARDING for your students! Please leave feedback on TPT letting others know how it worked for you!